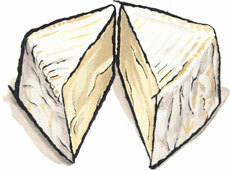 Trillium Cheese for sale. Buy online at Zingerman's Mail Order. Gourmet Gifts. Food Gifts. Tulip Tree Creamery, located in Indiana, right in the heart of the midwest, makes an elegant little cheese named Trillium. For those of you who don’t count botany as a hobby, a trillium is a three-petaled flower that blooms above three green leaves. Just like the flower’s petals, this cheese stands out among many other lovely triple creams. All the milk for these little gems comes from a herd of cows that live on one nearby, sustainable farm. The owners, Laura and Fons, work closely with the dairy farmer to ensure the quality and consistency of their cheese. The result is a heavenly little triple cream your friends and family will gush over. The texture is silky and luscious. The flavor is buttery soft, ultra rich and gently sweet.